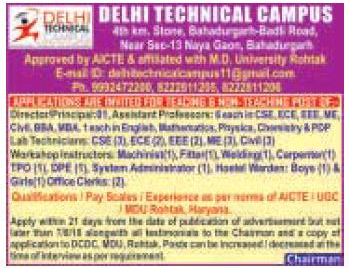 Delhi Technical Campus Bahadurgarh has advertised in THE HINDUSTAN TIMES newspaper for the recruitment of Assistant Professor / Principal / Director Plus Non-Faculty jobs vacancies. Interested and eligible job aspirants are requested to apply within 21 days from 17th July 2018. Check out further more details below. About College: DELHI TECHNICAL CAMPUS (DTC) strives to impart quality education to transform students to become dynamic in their approach, thinking, attitude & life style.DTC always tries to improve learning process as a Centre of excellence. Project based learning approach at DTC has given a new meaning to the learning process for budding engineers. Various activities like LCD presentation, Group Discussions, Case Studies, Lab Innovations & TPP have led to creative learning process which leaves everlasting impression on young mind. The faculty is highly motivated & competent. Every Department is enriched with Professors, Assistant Professors, Associate Professors and Lecturers having experience in Teaching Research & Industry.